In 1850 Charles Dickens came to Tonbridge to see the Telegraph Office at the Railway Station, and write about it in his weekly magazine ‘Household Words'. To Dickens, the electric telegraph – the world's first instantaneous means of long-distance communication – was ‘the most wonderful' of ‘all our modern wonders'. The Tonbridge Telegraph Office was the nerve centre of the telegraph network of the South-Eastern Railway, and had been set up by the go-ahead electrical engineer Charles Walker, who lived in the town. 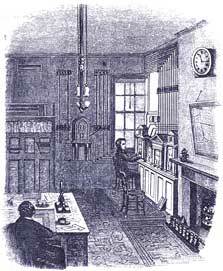 Dickens wrote a description of the room, pictured below, with its instruments for sending and receiving messages looking like ‘the fronts of little mahogany churches with big clocks'. The telegraph office at Tonbridge station, c.1850. An operator is using one of the instruments (right), while the supervisor sits at his desk. The telegraph had quickly proved itself indispensable for the efficient running of railways, but was also used for other messages. In 1848 the Tonbridge office was busy night and day relaying messages to London from Dover about the turbulent European political situation. These were brought over by cross-channel ships, there being no undersea cables at that time. Dickens recounts how a man about to be executed for murder at Maidstone received a last-minute reprieve from the Home Office transmitted over the South-Eastern lines, only to have it countermanded, again by telegraph, a few hours later. Messages were sent letter by letter (like texting today) along overhead wires by manipulating handles that caused the needles on the front of the instrument to flicker rapidly to left and right, the pattern of flickering varying according to what letter was being sent. At the other end of the line the recipient watched the flickering of his needles and read off the sequence of letters for a colleague to write down. 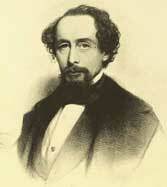 Dickens was amazed when a message came through from Dover at the astonishing rate of 17 words a minute. He was also surprised to learn that even Mrs Walker could operate one of these instruments which her husband had set up in their home on the Hastings Road to communicate with his Office down at the Station. 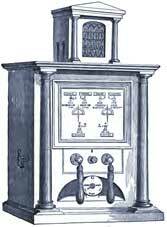 Walker was chief electrician to the South-Eastern Railway for 37 years, and a leading pioneer in the field of telegraphy. He was elected a Fellow of the Royal Society and went on to be President of the Royal Meteorological Society. Two of the pictures on this page are from his book ‘Electric Telegraph Manipulation' which is more interesting than its title implies, and can be read on the web here. It includes a description of the Tonbridge Telegraph office and lists some of the sorts of messages that were transmitted.